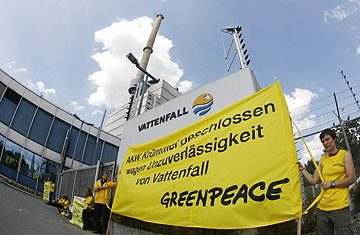 Greenpeace protest in front of the German nuclear power plant Krümmel in Geesthacht, northern Germany which caused a major power outage in Hamburg. Traffic lights suddenly went black in Hamburg, Germany's biggest port, on Saturday afternoon after a nearby nuclear reactor called Krümmel shut down when a transformer short-circuited. Although nobody was hurt and the lights were back on by nightfall, the accident has reignited the debate over nuclear power in Europe's most vehemently anti-nuclear country. But as Germany gears up for federal elections in September, a generational shift in attitude could mean that opposition to nuclear power isn't the vote winner it once was. "I didn't organize the incident, it was the nuclear industry that said something like this couldn't happen," said Germany's Environment Minister Sigmar Gabriel on Monday. Now Gabriel is calling for the government to mothball Germany's eight oldest nuclear plants right away, accusing Chancellor Angela Merkel's nuclear energy policies of being "irresponsible" and "potentially dangerous." But with his Social Democratic Party expected to lose to its stronger coalition mate, Merkel's Christian Democrats, come September, his attacks are seen as little more than election-year grandstanding  especially as public opinion in Germany is slowly shifting in the other direction. Under current laws, Krümmel is set to shut down in 2018. The Social Democrats struck a deal in 2001 with then-coalition partners the Greens to phase out the last of Germany's 17 reactors, which currently provide one-quarter of the country's electricity, by 2021. The Atomic-Exit Law was a big victory for the demonstrators who had been turning out in their tens of thousands since the '70s to protest the depositing of nuclear waste in old salt mines. But Merkel, who agreed to leave the deal intact while forming a coalition with the Social Democrats in 2005, now wants to "phase out the phase out." She argues that it is unrealistic in the face of high oil costs, will endanger renewable energy goals, and will leave Germany vulnerable to the whims of its largest gas supplier, Russia. If the chancellor's party manages to ditch the Social Democrats to form a coalition with the pro-business Free Democrats in September, Merkel may get her wish to keep nuclear plants open longer. And she may get help from the country's youth. Germany is still the center of anti-nuclear sentiment in Europe, but a new generation of Germans with shifting priorities has their doubts about the 2001 agreement. The government's stated goal on greenhouse gases is to reduce emissions by 40% from 1990 levels by 2020 and 80% by 2050. Without nuclear energy, many are asking, is that a mere pipe dream? Countries such as France, Finland, Italy, Sweden, and the U.K. are already eyeing nuclear power to help them meet emissions reductions targets, leaving Germany isolated among its E.U. and G-8 partners. And German Greens who continue to bang against the metal fences surrounding nuclear plants as they call for shutdowns are increasingly isolated among their European peers, some of whom see nuclear as a viable low-carbon alternative, however imperfect. After three decades of opposition, the number of Germans who support nuclear energy is creeping upwards. According to surveys by the Bielefeld-based Emnid Institute for both the atomic lobby Deutsches Atomforum and the anti-nuclear organization Greenpeace Germany, 48% of Germans are in favor of extending the remaining running times of the country's nuclear power plants, compared to 40% two years ago. "People are starting to come around to the idea of keeping our plants open longer," Claudia Kemfert, head of energy and the environment at the Berlin-based DIW research institute, tells TIME. Kemfert says that public opinion still makes it impossible to build new nuclear plants in Germany, but advocates extending the life of newer plants for 40 to 50 years. "We have already spent $55 billion on them," she says. "Rather than having a sunk investment, we can use them as a bridge to buy time while we work on cleaning up coal, which provides 50% of electricity in Germany." If Germany rolls back the phase-out, Gina Gillig, co-founder of Mothers Against Atomic Energy, worries that her decades of anti-nuclear activism will have been for nothing. "Many people still protest, but Chernobyl happened 23 years ago, and since then it has been a process of forgetting," says Gillig, whose two children were toddlers when the radioactive plume drifted over Germany from what was then the Soviet Union. But even some of those who are old enough to remember Chernobyl and have lingering doubts about nuclear power still want to keep plants running, as they look at the bigger picture. An April poll by the Forsa Institute showed that 57% of all Germans consider atomic energy "dangerous or very dangerous." Of those aged 18 to 29, only 49% are worried about the safety of nuclear energy. Fears of a Chernobyl repeat have long dominated the nuclear debate in Germany, but Kemfert says the generation that has no memories of that infamous accident sees things differently. "Young people right now are pragmatic," she says, "and they are more worried about climate change than anything else." Back in Hamburg, the traffic lights are flashing red, green and yellow again, fed by coal and gas plants. The incident on Saturday was strike two for Krümmel, which had reopened only last month following a two-year shutdown after a transformer caught fire in 2007. Officials at operator Vatenfall Europe say Krümmel will stay offline for "several months" until they figure out what caused the latest short circuit. Whether Germany will pull the plug on the nuclear plant for good is up to the voters in September.